The Chris Tucker act can only go so far, or more like 90-minutes. That’s why the next two Rush Hour entries started to fall flat. To be clear, Tucker’s Detective Carter is more or less a modern version of Eddie Murphy’s Axel Foley, only louder. If there’s anything Tucker lacks it’s range. He’s at a 10, while Murphy could switch it up anywhere starting at about one. Tucker’s loudmouth antics do work paired with the mellow, collected Jackie Chan, paired up with the LAPD in an investigation into a kidnapping. It’s like a release from anxiety of his mouth, especially early when Chan acts as if he doesn’t understand English. Once paired, Rush Hour follows the formula of any buddy cop affair, but does so with flair as Chan was finally able to showcase his talents to a wide Western audience who had yet to fully appreciate his talents. Later entries would rely on increasing special effects, while the original handles as much as possible in-camera. He goes all out, with a rousing battle against the FBI while handcuffed to a steering wheel, and a zany pool bar scuffle loaded with brilliant choreography. The film finds that right tone, credit to director Brett Ratner, Chan, or any of the three writers who put this together. It’s never too dark, and never too light. Rush Hour maintains a sense of danger and chaos, putting a child in harms way although never with any gratuitous intentions. The emotions of a distraught father are enough. The plotline, aside from Soo Yun (Julia Hsu) herself, all seems secondary at times. The screen is dominated by Chan and Tucker, as is nearly all of the dialogue. Sang’s (Ken Leung) line, “you talk too much,” as he speaks to Carter on the phone couldn’t be any truer, unless of course he was referring to the sequels. 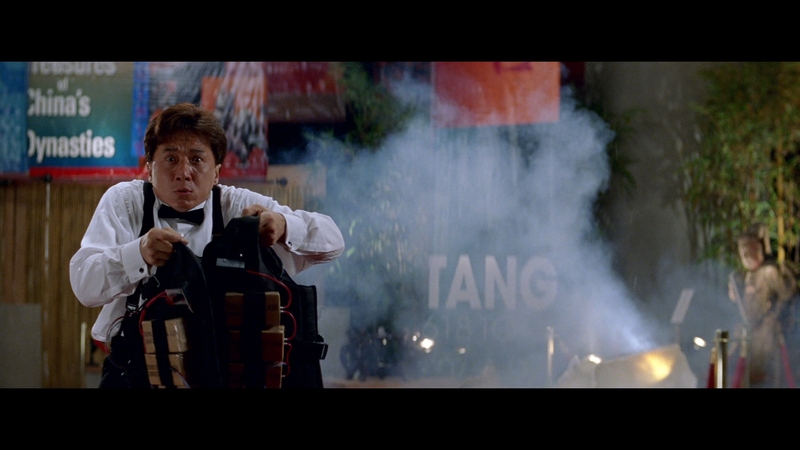 New Line’s release of Rush Hour to Blu-ray is fantastic, a glowing, colorful VC-1 encode with minimal problems. Those issues are scattered about, ranging from chroma noise on the walls inside the Chinese restaurant at the hour mark, some sporadic low light noise (awful in an aerial of a helicopter at 1:18:49), and inconsistent sharpness. A conversation between Chan and Tucker at 52:28 is weirdly soft, a wild departure from almost every other close-up in the film. The transfer handles complex material cleanly, from the bar loaded with smoke at 31-minutes, to the frantic action. There are no instances of smearing or image break-up. Thankfully, everything seems to be left untampered with, the grain generally well resolved if slightly noisy where noticeable, and no visible edge enhancement. Blacks are full, rich, and natural, with some crush spread lightly. The occasional black suit or pants will lose any detail in some darker environments. Most notable here is the color. Blazing greens highlight the plants outside of Han’s (Tzi Ma) home, to the hot red suit worn by the backroom casino owner. Nothing bleeds or looks overcooked. In fact, flesh tones can seem overly flat and peaked, possibly simply because of the saturation on display elsewhere. Only later in the film, in warmer lighting scenarios, do they carry some weight. Detail is at times inconsistent, although medium shots perform admirably the majority of the time. Ignoring the above-mentioned softness, Rush Hour can look outstanding in close, resolving fine textures with ease, and providing a deep level of clear, precise definition. Environments are spectacular as well, from brick houses to trees to skyscrapers. All show outstanding levels of detail or texture where appropriate. New Line’s DTS-HD 7.1 mix isn’t the rousing, epic piece of audio you would probably expect. The two extra surrounds seem to exist purely to push Lalo Schifrin’s score through the surrounds. The pan effect is quite spectacular when the music is left to its own devices, presented with a strong, distinct swirling effect that is both satisfying and immersive. Gunfire is certainly evident in the many shoot-outs. One of them around 1:04:40 captures bullets whizzing by front-to-back, pinging off objects as they connect. It’s aggressive enough, although enough to warrant mixing in those two extra channels? Not really. The echo effect late inside the expo center is pretty impressive, although a 5.1 mix would have surely sufficed just as well. There are no moments of positional dialogue outside of the center. Bass is powerful if a bit routine. There’s nothing too earth-shattering. An apartment complex exploding provides a nice jolt, as does the car loaded with C4 shot by Tucker early. It’s a decent rumble, enough to make its presence felt. It’s tight and controlled, balanced well too, but flat overall compared to many modern efforts. Extras begin with a commentary by Brett Ratner. He discusses his student film as well, Whatever Happened to Mason Reese. He also chats (optionally) over two music videos. Composer Lalo Schifrin has his own track, but over an isolated score. A Piece of the Action is a now dated making-of, but still worth watching given the detail. Some brief deleted scenes run about three-minutes, with a trailer, uh, “trailing” behind.